During the days 9th to 13th of march, it took place the tourism fair ITB in Berlin, Germany, the biggest and most important touristic events all around the planet which has the participation of 185 expository countries. Every year, the ITB (Intenationale Tourismus Börse in German), receives around 10 000 exhibitors coming from all the different countries and regions participating. This is an ideal opportunity for cities, tour operators, airlines, hotels, booking system developers, and other business related to the touristic industry to get themselves known and show their services in order to catch potential clients’ attention and display the destination they represent. This touristic fair had its origins in 1966 with only 5 countries participating actively; since then, it has evolved until it end up being the global success it is nowadays. With approximately 180 000 visitants, the ITB is the most important and well known touristic industry event for all the business people who attend it find a way to expand their contacts and establish new business alliances. Furthermore, all regular people can also go and join the fair, making it an excellent opportunity for everybody to discover the whole world in just a few hours. During this edition, the 50th of the ITB, Costa Rica had an outstanding participation among all the countries participating by winning the award as the “best stand of the American continent” and, at the same time, also got the award of “the best stand” of the entire fair. This prize is the result of all the hard work and determination of the Costa Rican touristic area, manifested Mauricio Ventura, Tourism Minister. The designated space for Costa Rica was of 250 m2 from the total of 160 000 m2 of the whole fair area. The Costa Rican Tourist Board work hard to create a stand able to reflect the ticos’ famous hospitality and sympathy, and the majestic natural resources of the country. 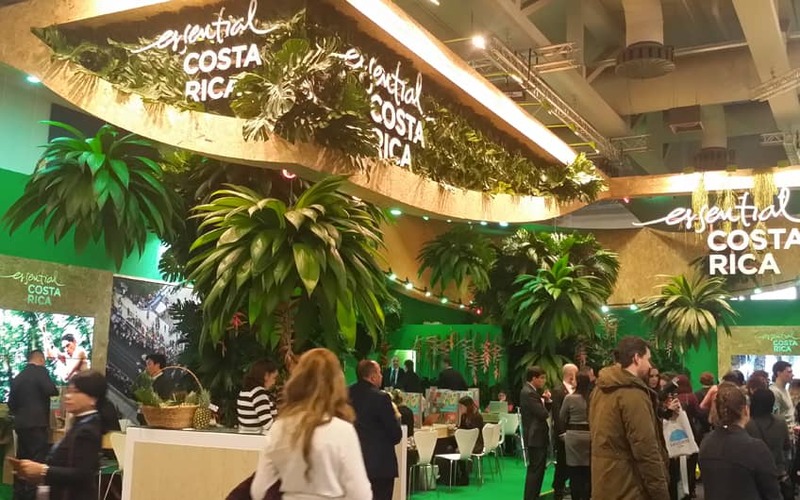 Using creativity and innovation, a unique stand was designed with the purpose of showing Costa Rica as an authentic destination that offers unforgettable experiences. The stand included 4 trees of 13 feet of height and 9.8 of diameter as part of the main structure. Moreover, the decoration was created with foliage cultivated especially for the exposition and not extracted from the forest. A total of 64 boxes of foliage including more than 6000 flowers and different kinds of plants were used to build part of the scenic composition. Besides the tree structure and the decoration with using plants and flowers, the stand incorporated elements of the Costa Rican culture with the aim of showing the visitants images of the traditional turnos, demonstrations of typical dances, music and videos, and drink and food samples such as: national chocolates, coffee, pineapple, cajetas (a traditional type of sweet candy), copos (sweeten crushed ice), and even mini cotton candy. The designated space to create the stand was complemented with the installation of audio devices which were broadcasting sound coming from nature and typical music, LED screens and videos projected on the walls. It is important to highlight that all the area was prepared using only recycled materials and the use of printed material was reduced as much as possible by making use of audiovisual equipment. But, what does this really represent for the country? Having an outstanding participation in this fair helps the commercialization opportunities and the display of Costa Rica as brand, which allows starting relationships with wholesale partners and strengthen the efforts made by the airlines, hotels, and tour operators. From the old continent, Germany is the place where most of the tourists come from; during the last year, 66 450 of the international arrivals getting to the country came from there. German tourists are the ones who stay longer in the country, an average of 17 days per visit. By negotiations made during last years in the ITB, many business achievements were accomplished; for example, the increase in the weekly Condor flights. The German market is not only emissary of tourists coming from Germany, but also it sends people from Austria and Switzerland. This fact is ideal for the national economy because the largest the number of tourists getting to the country, the largest the incomes obtained. 29% of the national exportations are generated thanks to tourism, 26% of the whole labor force is directly or indirectly linked to tourism, and 20% of the Gross Domestic Product (GDP) comes from the touristic area. For this reason, obtaining an international tourism award can significantly help to increase these numbers and improve the national economy. Just like if it were the “Tourism Olympic Games”, the award won and the great participation in the ITB can be considered as a historical event that shows that no matter how small a country can be, its greatness and most valuable resource is the people.